Summit Entertainment has finally dropped the first trailer for Robin Hood, a prequel once known as Robin Hood: Origins, which takes the legendary robber back to his glory days, when he was just starting out. The movie stars Kingsman breakout Taron Egerton as the title hero, with Jamie Foxx arriving as his sidekick Little John. The movie looks action packed and period specific. Are you ready for another revisionist take on Robin Hood? Ever couple of years, the old mythic adventure gets dusted off for a new generation. And it hasn't really been that long since director Ridley Scott tried his hand at turning the age-old story on its head with the 2010 movie of the same name, Robin Hood, which starred Russell Crowe and Cate Blanchett. It's been eight years, now millennials have a Robin Hood to call their own. This latest iteration comes from Summit Entertainment, and is aimed at the Twilight and Hunger Games crowd. The story this time around follows a war-hardened Crusader and a Moorish commander who mount an audacious revolt against the corrupt English crown. The adventure thriller is packed with gritty battlefield exploits, mind-blowing fight choreography, and a timeless romance. This is the Robin Hood story audiences have never seen before, introducing the legend before he became an icon. 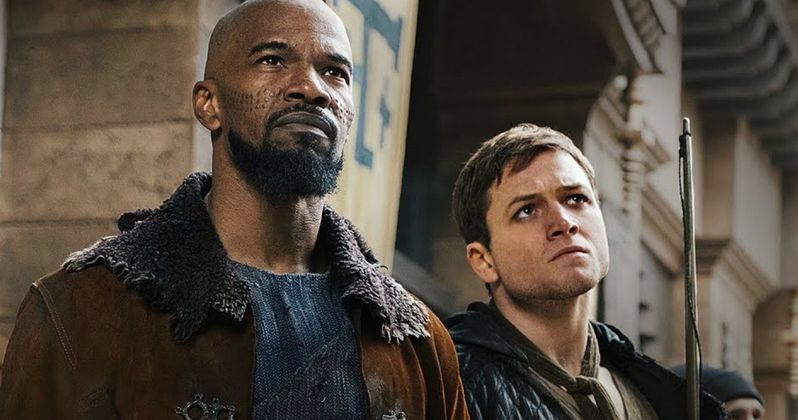 Robin Hood grabbed Taron Egerton fresh off Kingsman: The Secret Service, and has Jamie Foxx serving as the perfect back-up and foil. Joining them are Fifty Shades of Grey favorite Jamie Dornan as Will Scarlet, Briges of Spies star Eve Hewson as Maid Marion, Tim Minchin as Friar Tuck, and Paul Anderson as Guy of Gisborne. Otto Bathurst directs this gritty new take on Robin Hood, which has our main hero return from The Crusades to find Sherwood Forest overcome with corruption and evil. He teams up with his band of merry outlaws, taking matters into his own hands to set things right, though this is perhaps a much more serious take on the material than seen in recent past. Joby Harold write the screenplay for Robin Hood, which is produced by Leonardo DiCaprio, Jennifer Davisson Killoran, Basil Iwanyk, Tory Tunnell and Joby Harold. It hits theaters on November 21, 2018. Before 2010's Robin Hood, there was 2001's Princess of Thieves, which starred Keira Knightley in the title role as Robin Hood's daughter. And 1991's Robin Hood: Prince of Thieves starred Kevin Costner in the title role. Before that, there were countless takes and iterations on the timeless character. Now, we have what looks like one of the funnest plays on the character yet. You can checkout the first trailer thanks to Lionsgate Movies in conjunction with Summit Entertainment.